BENGALURU: Forget curiosity. The best ideas come from boredom. 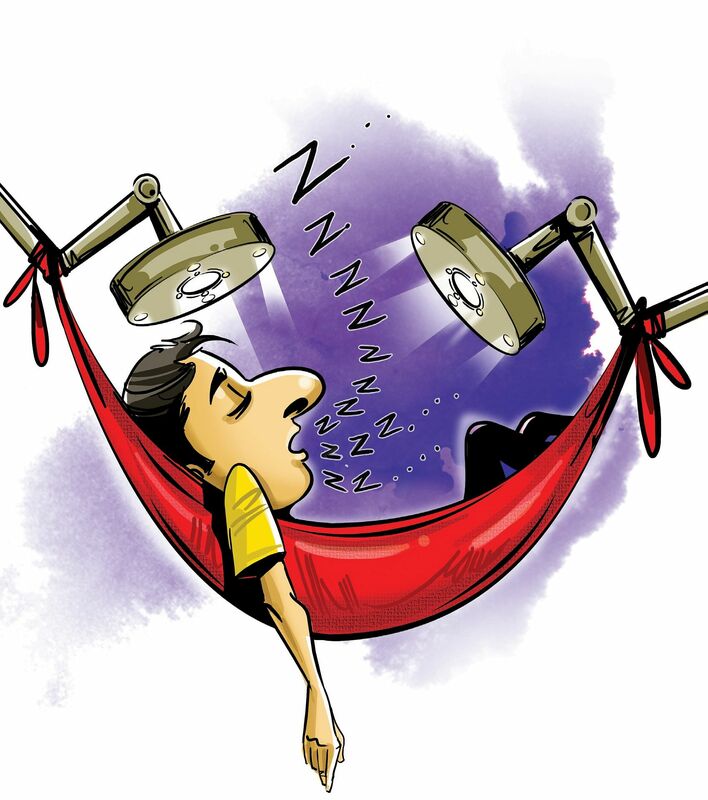 Three Bengalureans, tired of monotony, are organising a sleep concert today. The organisers – Badrinarayan Seetharaman, Ashwin Kulkarni and Qusai Kathawala – are co-founders of Gathr, a group that conducts social experiments regularly. This group started to provide interesting alternatives to routine weekends. At the sleep concert, there’ll be music, like every other. But unlike the other concerts, you are expected to sleep through this one. Music will feed your soul and a light, Lucia No 3, will give you an out-of-body experience similar to the euphoria from psychedelic substances. Lucia No 3 is a lamp with LED lights, designed by neurologist and psychologist Dr Dirk Proeckl and psychologist and psychotherapist Dr Engelbert Winkler. A person sits in front of this, with eyes shut, and is flashed with a pulsing light. It is believed to activate the pineal gland that affects sleep cycles. Rene Decartes also believed that this gland housed the human soul. By affecting the gland is how the light gives participants a “high”. The lamp is kept at 1000 Petals, Indiranagar, which is the venue for the programme. Founder of 1000 Petals, Amitabh Swetta ,brought a Lucia No 3 to India from Austria. Amitabh started meditating even at a young age when he was living in Osho’s ashram. He had an unforgettable meditative experience with a normal blue LED light and he shared the light and its experience with his friends. Last year, he got a WhatsApp message from his friend who told him that a lamp for meditation has been introduced in Australia and New Zealand. At the Sleep Concert, participants get to try this out. Badrinarayan, Ashwin and Qusai are reinventing the sleep concerts that were organised in the 1980s by music composer Richard Rich. He was well known for playing abstract drones to his sleeping audience to experiment the Rapid Eye Movement (REM) sleep cycle. “We are trying to explore what happens in between sleep and wakefulness,” says Badrinarayan. “From contemporary and pop to classics, there will be a wide variety of music playing for music appreciation and body exploration.” At the sleep concert, no hallucingenic substance will be used, only music, lights and breathing techniques. The programme begins at 11 pm today and it will kick off with a breathing exercise. Then the music will be a constant and participants can drop off to sleep at any point. Ideally, they should be “semi-sleeping”, according to a participant. At 3 am, they will be served hot chocolate made from fresh cocoa to rejuvenate their senses. The sleep meditation will continue till 8 am on Sunday. Arvind Ghimiray, a final-year student at National Law School of India, is looking forward to the event because he is fascinated with the idea of lucid dreaming and curious about guided meditation. Badrinarayan, a graduate from National Law School and a research scholar at Azim Premji University, is the co-founder of Gathr. Gathr started as an app around 6 months ago, as a platform to organise activities in non-commercial spaces such as living rooms, studios, galleries and parks. Prior to the sleep concert, the group had organized others such as a DIY cupcake baking session, “intimacy hack” session in which participants were encouraged to communicate non-verbally and an astrophysics concert. The events became more popular than the app, so development of the latter is on hold. Online tickets cost `1,500, counter ticket costs `1,750.